Tours in the Environs of Castoria. — Fiorina. — River Erigon. — Gheortcha. — Lake of Lychnidus. — Ochrida. — River Devol, or Genusus. — Lake of Prespa, &c.
the Bulgarian inhabitants called the Vardar of the Sarigul (the yellow lake,) to distinguish it from the other Vardar, the Axius of antiquity; and I concluded it to be the Erigon. According to Livy it rises in Illyricum, and traversing Paeonia falls into the Axius. It proceeds from glaciers in Mount Dora, (so called by the Albanians, from their term for snow; but the common name is Mount Vitzi) situated seven leagues from Castoria. Pushing forward beyond the Erigon for an hour, in compliance with the desire of my guides, who expected every step to be beset by robbers, we came to Machala, a large Bulgarian village, on a river still running eastward. This I supposed to be the Osphagus; and four miles further north is situated Fiorina, from which place in seven hours caravans arrive in Monastir. Prevented, by a report of the plague appearing in Fiorina, from approaching that place, I returned for the night to Machala, and came back in good time to Castoria. In speaking of the time employed by caravans on a route, it is proper to state that the day's journey from one conak or lodging-place to another, is usually reckoned to demand eight hours, or to be eight leagues. The conak therefore corresponds to the day's journey mentioned by Pausanias, in his description of Greece. From Castoria the distance across the mountains to Conitza is reckoned about south-west three conaks, or twenty-five leagues. therefore remained wjth myself to determine what was to be done. I immediately desired the attendant to return, to learn whether his master, having no orders to welcome me, had any orders to oppose my passage. This question caused no small deliberation; for it was not till after a full hour's expectation, that the physician of the bey appeared, offering me accommodation for the night in his own house, but expressing the bey's regret that he could not permit me to continue my route. Consulting with my guide, we turned northward up the course of the Devol to Bobsouri, a Bulgarian village, where we passed the night. The journey lasted three hours, along a solitary desert valley; and I was informed that the Devol had its springs at Tournovo, four leagues still farther to the northward. On the following day, taking a circuitous route by the north-east, we returned at night to Castoria. I ought here to mention that, in my disappointment at Piassa, Mehemet Bey was not personally to be blamed. The story was curiously characteristic of his precious relative Aly. Four years afterwards, I learned from a confidential person of those parts, that had I insisted on continuing my journey by Piassa, the bey would not have opposed me. In that case, he had orders to have me assassinated in the mountains; and to vindicate himself from suspicion, he would have hanged all the people of the nearest village, should it be necessary, as the perpetrators of the murther. My tour in that quarter had, as was before stated, been long opposed by the tyrant of Janina; nor did his recent consent to my journey in Macedonia, in any way show his suspicions of my purposes to be abated. His orders to his kinsman would have at once set him at ease on that head. Having thus been precluded from personally visiting the environs of Gheortcha and of Ochrida, its lake, the river Drino, &c. I must pray my readers to accept the following notices, furnished by a person very competent to make the requisite observations, who resided for two years in those places, and on whose plane and informations I can confidently rely; his name must not however be mentioned, nor his situation described. text of defending their master's subjects, placed a garrison in it. Thus, after ten years of devastation and rapine, Voschopolis disappeared from the earth. Two hundred huts, occupied by a number of poor shepherds, are now all the remains of that promising place; and they will soon sink under the ruins of those edifices which once announced its prosperity. The Apsus, which passes along the valley of the Moschi, in a course of twelve leagues down to Berat, waters now only silent fields, interspersed with villages in ashes, and the graves of their former cultivators. to be remembered, that, unlike many of the monastic orders of the west of Europe, the Greek monks are strictly devoted to all branches of rural labour by their own hands, over and above their performance of the prescribed religious services. 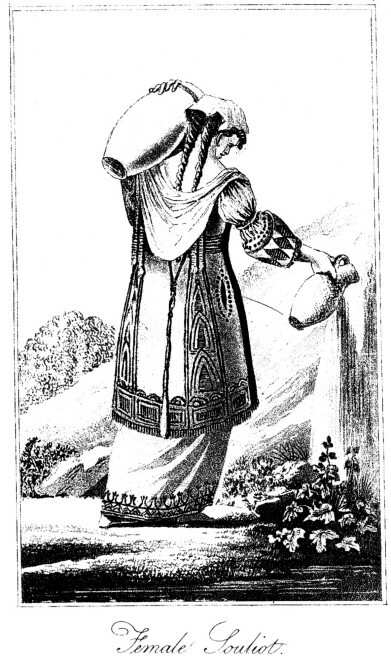 The fountain of St. Nahum, like the Arion of Rugusa, that of Vaucluse in France, and other similar issues of subterrene rivers, frequent in mountainous regions, is regarded by the people as the true source of the lake of Lychnidus. Behind the monastery is a large village, fortified by a tower garrisoned by Albanians, for the defence of the roads, and especially for the collection of duties. For among the few things introduced by the Greek emperors, which were retained by their Ottoman successors, duties, taxes, and impositions of every kind were esteemed too sacred to be abolished. Below the monastery, crossing the stream of St. Nahum by a bridge, you ascend an eminence, on which was built the Lychnidus of ancient times. The scholiast on Ptolemy, who wrote posterior to the irruption of the northern nations into Greece, to Lychnidus adds Achrida, a term borrowed from the Bulgarians, and probably adopted by them from achris, a Greek word of the time of Justinian, denoting an insulated cone or peak, a denomination characteristically applicable to the position of the ancient Lychnidus. On its restoration by Justinian, this city, as well as Celetbrium and others, was styled Justinianopolis: but the reader must be cautious in giving credit to the extravagant enumeration given by Procopius, of the splendid edifices with which the new city was adorned. For the accuracy of that writer is fully as much to be suspected as his skill in topography. According to Cedrenus, Lychnidus was situated on a lofty hillock, in a strong position, in the vicinity of springs of water and of the lake, in a tract of country fertile in corn; a description justly applicable to the ruins of St. Nahum, now confined to a decayed wall of inclosure, with towers and battlements, and fragments of a few churches within it. but could this be the Preria of the Muses? Ochria, the capital of a district, certainly the wildest and the least known of any in the Turkish portion of Europe, contains six mosques, three churches, a multitude of baths, and a population of 1,300 families, of which 600 only are Mahometan. Valley of Resnia. — Prespa. the last among people with whom mere brutal valour is the chief recommendation, of a Turk, Souli of Starova, who having been twice proscribed (Fermanly,) on account of his lawless depredations, succeeded at last in being appointed Romily-Valessi or governor-general of Macedonia, and like every other successful insurgent in Turkey, died full of honours and authority among his people. On the south-west of the district of Starova, commences that of Megali-Gruca, a name Greek and Albanian, denoting the great defile or strait, apparently corresponding to the Pylos of the Itiperaries. This and the adjoining Micri-Grouca, (little strait,) produce a race of horses, small indeed, but strong and active, employed by the Albanian light cavalry, if such a name may be applied to bodies of men neither equipped nor disciplined. On the east side of the range of mountains, which form the eastern boundary of the lake of Ochrida, is the productive valley of Resnia, inhabited by a handsome laborious race, who, in their external appearance and habits of life, remind the stranger of the people of the more northern country, from which they originally emigrated. Eight miles to the southward of Resnia, you come to Prespa, the see of an archbishop, situated near a lake two leagues long and four miles broad. A quarter of a mile below this lake, is that of Drenovo, three miles long by half as much in breadth, which probably receives the waters of the former by a subterraneous canal. After a course of ten miles, the stream from the lake of Drenovo unites with the Devol, or Genusus, before it enters the valley of Gheortcha. The variation in the descriptions of these two lakes, may be attributed to their several appearances in different seasons of the year; for in winter they form one continued sheet of water, which in April, when the rains have ceased, are divided into two, as they ought certainly to be considered.